The PowerTap SL+ on a Velocity Deep V rim with DT Swiss Competition spokes is mine! It was a team mate's "old" wheel from 2009. As he said about the deal, "I'd rather sell it to someone on the team and ensure we ALL get stronger." Word. I love discounts on well loved bike stuff! And, by the end of the season I may have a national champion's old wheel. No more training without knowing my watts! I'm excited! And, training smarter means bringing my lofty goal of finishing the summer a Cat 3 more within reach. That's all for now. Just had to say how excited I am. I'm not sure why I had continued to search for other competitive cyclists with an ileostomy. I had resigned myself to not finding anyone else a couple of years agoe. I feel safe saying that my internet search skills are truly excellent, refined by years of undergraduate and graduate education. When I stumbled upon this page, by a competitive cyclist with an ileo since '98, I was shocked. I got that funny feeling of mixed excitement and disbelief that makes my head buzz. Immediately I thought, "I have to email him! Please please please please, write me back!!!!". I hadn't realized exactly how important it would be to me to just know that this pursuit is possible - that I'm not crazy for thinking that with training, I could perform at an elite level in an endurance sport. Of course, it is crazy to think that a person would have all the answers. Or, that his answers to questions about hydration and things like cycling with ostomy belts (which, by the way, he makes) would work for me - everyone is different. But, HE EXISTS!!! And, that's what matters. Cycling is a very specialized sport. Dedicating yourself to cycling is not the best way to achieve overall fitness, if that's what you're looking for. And, cycling at a high level (like running or distance swimming), brings its own set of specialized physiological needs, beyond those of having a digestive disorder. So, go ahead and throw all of that popular anti-carb, anti-calorie, salt-restricted nutrition advice out the window! In fact, go ahead and throw the BMI chart out the window with it (I'm "normal" on the BMI chart, but still heavy for my height for a cyclist). And, it will probably no longer be possible to get sound nutritional advice from the general, non-endurance athlete, community or professionals who aren't used to working with endurance athletes. But, then what do you have left to reference? I've been a "one of a kind" to all of my physicians, nutritionist, and coach. But, at least now I know for sure that I'm not truly the only one. We are just a very tiny minority. There are probably even another two or three competitive cyclists out there in the world who have or had an ileostomy at some point. But, it's making contact that matters. This reinforces the reasons why I created this blog in the first place. I want to be visible, just in case it helps somebody else along the way. Knowing that he is out there cycling with a team, and has been for over 10 years, brings me real hope and comfort. And, it makes me more determined to succeed - because I know it is possible. Rainy winter days. Powertap or not? Rain, freezing rain later on, and lots of wind. That was today's forecast. When I woke up, I had a brief glimmer of hope of going for a ride outside. But, then when I checked the weather and saw the quickly plummeting temperatures and wind speed I had second thoughts. And, then when I opened the door to let Sharkey outside, and was almost blown back into the kitchen (!) I resigned myself to more trainer time. 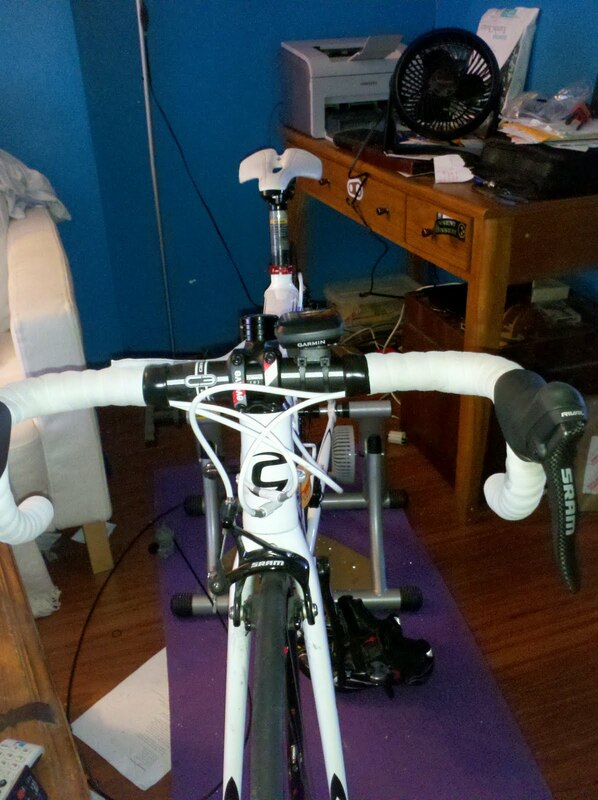 The trainer corner: wedged between the couch, a coffee table, and a desk. The fan stays on even in cold weather! Yoga mat to avoid sweat stains on the floor. And, now you know why trainer time gives me cabin fever!. I sometimes wonder if all of this riding inside on a trainer is going to have unexpected consequences. Are all of these just below threshold intervals going to improve my hill climbing abilities when I actually get out there (and the roads aren't slick with ice/snow/freezing rain)? I hope so. I'm currently debating whether or not I want to snag a powertap rear wheel off of one of the guys on the Pitt team. It's his older, 2009 wheel. It would be really really helpful to be able to see my watts all the time, not just when I'm at our sponsor shop's training studio. But, then part of me feels silly for investing in that sort of training equipment at this early point in my development as a competative cyclist. Getting a powertap wheel wont make me better or faster, and unfortnately many people newer to racing seem to feel that fancy equipment does make them a better cyclist. And, they get made fun of. And, nobody wants to get made fun of for having excessively fancy equipment beyond their training needs. So, there lies the problem. Get the powertap wheel for an unbeatable price now, and use it to improve my training? Or hold off for now, because there are many other things I can work on and see improvement without a powertap wheel to read my watts? Training tired/sick - "all pain is temporary"
Oh, right, tonight is Tuesday? That means 90mns of high intensity intervals including 5 x 2mns of fast pedaling and 3 x 8 minutes just below FTP (my threshold). And... I'm feeling a little bit under the weather. Not really sick. Just overtired from too little sleep, and maybe some exposure to sick people over the weekend. But, still, I hardly ate anything today. That alone is a sign that I'm not quite myself... I'm usually ravenous, all the time. Seriously, I'm hungry all the time. Anyway, so I ate a small dinner, drank some electrolyte mix before getting on the bike, and then after a brief facebook-based check-in with coach about the coming week, it was trainer time. Training under the weather is rough. It wasn't impossible, I just started feeling tired - as expected - and ended each interval feeling a lot more tired. Training mildly tired/sick takes more mental stamina than anything else. Maybe you're starting a little dehydrated from too much coffee or cold medication, and your heart rate is higher than you want it to be in your warmup, or you find that you need more than just the terry cloth on your gloves to wipe your snot today. And then, you look down at your index card and see another hour of pain! I start bargaining with myself. "What if I just cut off the last interval?" "What if I do only a 7.5 instead of an 8 on the perceived effort scale" "Do these last 30 seconds really matter?". And then I kick that part of my brain and shut it off. Partially because I know it is a slippery slope, and partially because I want to be proud of my effort and training slightly under the weather gives me more of a chance to be proud of my sweat. So, I do the intervals. On time and on target. And, it hurts. And I suffer through those grueling last 30 seconds of each interval. And, I remember that much quoted Lance Armstrong line "All pain is temporary" and take comfort. And, then, I'm done. I'm on the last 10 minutes of cooldown and my dog is wagging at me because she somehow knows that this means I will now detach myself from my bike, and pet her while I stretch. Sleep. And, revamping this blog. Working on revamping this blog... it might be ugly for a while. Trainer time tonight! And, then sleep. I've been feeling unusually sleep deprived and super cranky for the past week. It is true that I haven't been getting enough sleep (~6hrs/night), but that's not unusual for me. Maybe I've been coming down with something... there seems to be a lingering cough going around Pittsburgh. Or, maybe it's the increase in intensity of bicycling. Perhaps I should try to address this issue. My goal is to get to bed before 10pm tonight. We will see how that goes. Also, I am super excited that this movie is coming to Pittsburgh! Danny Chew, the masochist who invented the Pittsburgh Dirty Dozen Race and two time winner of the race across america, is giving a talk afterwards. Enjoy the trailer! And, if you live somewhere it's being shown, go see it in theaters! FTP testing. Lousy numbers, but a place to start! So, today about 10 people from the Pitt cycling team (self included) did FTP testing at an indoor studio with cyclops spin bikes with power wheels! I haven't ridden with a power-meter before so it was really interesting to see how even slight changes can have a huge impact on how many watts you are putting out. Besides cadence and resistance, slight changes in form made my watts jump or fall. I can see how useful riding with a power meter would be for refining my budgetting of energy, setting goals, and working on making my pedaling more efficient. I do confess to having been nervous about seeing my first numbers... and failing in front of the other guys in the group. The results were unimpressive, but not terrible terrible terrible either. My max watts were somewhere in the mid 240's. And, I was able to sustain ~200 watts for an 8 minute interval riding just below threshold, at a fairly reasonable 8/10 on a scale of perceived effort. This puts my current max watts (the unofficial numbers) at around 4.06 watts/kilogram. And, 200 watts puts my effort during the SSI (sustained effort at ) 85-95 cadence) at 3.39 watts/kilogram. This puts me in "not terrible, but not great" territory. We are retesting in 2 weeks, and I'm hoping for better numbers. I'm going to ask our coach about changing around my training block schedule so that I'm not testing on the third of a series of 3 consecutive training days. And, I will make sure I am better rested and adequately hydrated before next time - both things that were lacking today. Awesome work on bicycle commuting trends, and some very sad statistics about bicyclist deaths in the USA. Why do people hate on spandex?! I was just on the local bicycle commuter message board and, suprise suprise, yet again the conversation has turned towards the problem with those hammerheads wearing spandex. Does wearing jeans on your bike grant you moral highground? Or some other sort of merit award? Maybe it does. I sure as heck couldn't bike for any real distance wearing jeans - at least not a pair that fit properly! 1. Totally unrelated to having an ostomy, it is just downright unpleasant! When I bike, even just up the huge hill to work, I sweat. Sweaty jeans are gross. They stick to you, make your crotch feel damp for the next couple of hours, etc. Also, I have big quads and find jeans that fit my waist to have legs that are too tight if I'm doing more than standing or sitting around. Yes, I can bike slowly on flat ground in jeans, or even some fancier clothing. And, I do it on occasion. No, it is not my idea of a good time, and usually I'm going to encounter a hill or want to get to my destination faster than a sweatless pace. 2. I do have an ileostomy! This means that I have an appliance stuck to my abdomen just above the waistline of a pair of modern (fairly low waisted) jeans. When I bend forward on a bike wearing jeans or other pants with a hard waistband it starts to get into the dangerous territory of messing up my ostomy appliance. It's also uncomfortable to wear a waistband that compresses my abdomen in that sort of way. Disrupting my ostomy appliance is generally not a risk I'm willing to take. So I don't do it. Even on my commutes, I wear bike shorts. I am comfortable and get to work on time. Maybe those people who think that biking wearing spandex reflects poorly on a person's charactor should realize that for some people bicycling clothing is not about fashion. There may actually be a physical reason for wearing bike shorts even when just commuting. Don't shame me! I make a point of not shaming less serious cyclists for their lower yearly milages or higher resting heart rate. Just imagine how silly that would be! And, how much of a jerk would I be?! A big one. So, let's all respect each other and stop the judgement. It's Tuesday night, which means high intensity trainer time on my new training schedule! I've got my index card of intervals taped to my bars, The Girl Who Kicked The Hornets Nest cued on Netflix, and a couple of waterbottles filled and at the ready. Although I'm not excited about the cold, rainy weather here in Pittsburgh, I am glad to be back from my trip to California. And, I'm glad to back on my CAAD 10 and I'm glad to have finally put to bed any idea about me mountain biking... even for fun. I don't like when trees pop up at me out of the mist! Still, there is something special about wading ankledeep into the surf at sunset in the middle of January... and not being cold! 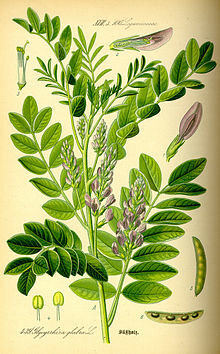 Did you know that the active ingredient (glycyrrhizinic acid) in liquorice (the real stuff, not twizzlers) can cause hypokalemia? I didn't until recently! Apparently, licorice and anything made with anise contain a potent and long lasting aldosterone inhibitor (it's more complicated, but I'll keep it simple). Aldosterone is a corticosteroid hormone that acts on the distal tubules and collecting ducts of your nephrons. In other words, it is a hormone that out adrenal gland makes that helps us to regulate electrolytes. So, if your body senses that you need to hold onto your potassium and sodium, your kidneys usually don't let you excrete more than you should be. At the most basic level, aldosterone stops you from peeing out all of your electrolytes. There are warnings about licorice use for people on dialysis because of the risk of hypokalemia. A simple internet search provides that much. However, nobody ever said a thing about licorice until a month ago when my new primary care provider asked whether I ate it. And, I do love licorice. I continue to be suprised at how something so seemingly important as electrolyte balance and nutrition were never addressed by any of the hospital staff, my GI doc, or my previous primary care physician. It has only been at my own request that I have had any type of attention to nutritional deficiencies, and my health plan has never covered a nutritional consult. One might think that these types of information would be necessary for a person without the majority of their intestines! Here's a project that I would love to have the time to take on: A campaign for the adoption of nutritional counseling as a standard of care for those with an ileostomy, or even IBD without an ileostomy. This type of intervention has been the standard of care for diabetics and heart disease patients upon diagnosis for years. It is time that people with digestive disorders receive the same attention. I should mention that I do see a nutritionist, specifically a sports dietician who is herself a pro iron-man (woman?) competitor. She's awesome and while there haven't been many competative cyclists with exactly my circumstances, was excited about the challenge of getting me back on track. However, those consultations have been all out of pocket expenses, and the only person who has ever asked me to get a nutritional consult is my coach. I recognize that I am fortunate to have a smart coach who could refer me correctly, the motivation and education to be able to stick to a plan, and the financial priveledge to afford nutritional advice. Licorice... a contributor to my problems with hypokalemia! It's true, I'm a big baby when it comes to cycling outdoors in cold weather. If it weren't for the problem of cold feet, it wouldn't be so bad. I have an awesome pair of Endura neoprene booties, yet my toes still get cold. So cold that I don't want to put a foot down at lights, for fear of falling over due to numb/painful feet. It's snowy here this week and I'm inside on the trainer. And, I'm looking forward to going to Southern California next week! Biking outdoors in 70 degree weather! No cold toes! It's been a busy fall semester, and I admit to having cut out a lot of the peripheral things in my life. But, not bicycling! I've been riding with the university cycling club for the past few months, and putting in my time on the trainer and track. Things are looking up. This year will be my first year competing at a collegiate level, in the C division (cat 3/4). In preparation for the cycling season, I'm getting into a more serious training schedule and finally sorting out a nutritional program to help me meet the demands of training. It looks like for the next few months until the season starts in March I will be doing two back to back endurance days, and two midweek high intensity days. I'm excited about competing and looking forward to seeing where a more structured plan will take me!